Tap Top sub dial to cycle dials textures, 8 in all. Tap Left sub dial to cycle 24 hour modes - Local, UTC, TZ1, TZ2 and TZ3. 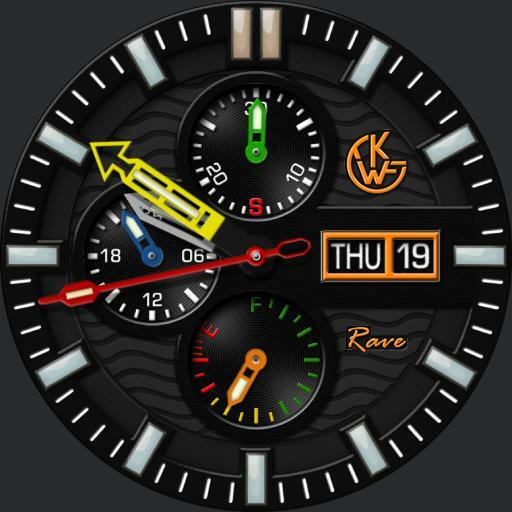 Tap between 1 and 2 area to cycle sub dial hand colors - Multi Colored or Grey. Tap between 4 and 5 area to cycle minute hand colors - Yellow, Orange, Blue, Green, Red and Grey. Tap Date area to cycle accent colors - Orange, Yellow, Blue, Green and Grey. Tap Bottom sub dial to cycle dim modes, Auto Always, On Normal, Always On, Off and Auto On. Default is On Normal.